Ray Rice and Matt Forte got what they wanted July 16: long-term contracts that sometimes elude NFL running backs. Neither Rice nor Forte was enamored of playing under the franchise tag tender in 2012, and negotiations went down to the wire. 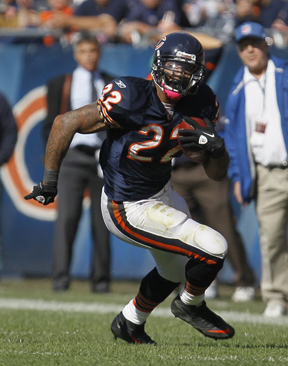 Then Rice scored big with the Baltimore Ravens, getting $40 million for five years, while Forte took a four-year, $32 million deal with the Chicago Bears. Also getting a longer contract just before the deadline was Jacksonville placekicker Josh Scobee, who will stay with the Jaguars for four years and $13.8 million. Rice led the NFL with 2,068 yards from scrimmage in making his second Pro Bowl. He helped the Ravens to their second AFC title game in his four pro seasons. "Ray has been an integral part of us earning the playoffs in each of his four seasons," Ravens general manager Ozzie Newsome said. "His production on the field speaks for itself, and his leadership in the locker room is outstanding." Although his numbers aren't quite at Rice's level, Forte is just as significant a contributor in Chicago's offense. Had he stayed healthy in 2011, he might have matched Rice, too. Forte made the Pro Bowl for the first time, finishing with 1,487 yards from scrimmage, 997 rushing. He missed the final four games after spraining his right knee in a loss to Kansas City. The Bears lost all but one of those games, falling out of playoff contention. Each of them would have played for the $7.74 million franchise tag — the average of the five highest-paid players at running back — had they not gotten the new contracts. "I'm proud to be a Chicago Bear and excited to be here for another four years," Forte said in a statement released by the Bears. "I've been working hard this offseason and am looking forward to joining my teammates at training camp next week. I'm glad the business part is done and we can all turn our attention to football and our goal of winning a championship." Scobee's tender would have been worth $2.88 million for 2012. His new deal is worth $3.45 million annually, with $4.75 million guaranteed. There are $400,000 worth of incentives Scobee could reach. Oakland's Sebastian Janikowski ($4 million annually) and Phil Dawson ($3.81 million) are the only kickers scheduled to make more than Scobee in 2012. His new deal tops recent ones signed by Tampa Bay's Connor Barth ($3.3 million) and Denver's Matt Prater ($3.25 million), who both were franchised. Players who are stuck with their one-year tenders are Lions defensive end Cliff Avril, $10.6 million tender; Falcons cornerback Brent Grimes, $10.2 million; Patriots wide receiver Wes Welker and Chiefs receiver Dwayne Bowe, $9.5 million; Cowboys linebacker Anthony Spencer, $8.8 million; 49ers safety Dashon Goldson, $6.2 million; Redskins tight end Fred Davis, $5.446 million; Browns placekicker Phil Dawson, $3.8 million; and Bengals PK Mike Nugent, one year, $2.6 million. None of them will be a pauper in 2012. Altogether, 12 players landed long-term contracts, led by the Saints giving quarterback Drew Brees the richest annual deal in NFL history. The 2011 Offensive Player of the Year signed a five-year, $100 million agreement; only Buffalo DE Mario Williams has gotten that much money, and his deal is for six years. Arizona DE Calais Campbell received the next most lucrative deal (five years, $55 million), followed by Eagles wideout DeSean Jackson (five years, $51 million). Colts defensive end Robert Mathis got a four-year, $36 million deal, with Titans safety Michael Griffin getting the same amount over five years. Raiders safety Tyvon Branch was next at four years, $26 million. Then came Scobee, Barth, Prater and Giants punter Steve Weatherford (five years, $12.75 million).